Are you living in the Oakville area and looking to purchase a top-quality BMW SUV? Here at Budds’ BMW we have top SUV ratings in Oakville. Whether you are looking to finance or lease one of our premium SUVs, we are confident that we can meet your financial needs. We are also confident that our customers have driven off the lot with full satisfaction, as we are one of the top-rated dealerships in Ontario. Whether you are planning to purchase a new or pre-owned luxury SUV, we are here to assist you in making the right decision for you at Budds’ BMW Oakville. At Budds’ BMW Oakville, we are confident that whether you purchase a brand-new BMW SUV or a pre-owned luxury SUV, the quality of your vehicle and driving experience will not be compromised. Our SUV ratings in Oakville have been consistently high for years, simply because we make this promise to you. We ensure that all of our certified pre-owned BMW sport utility vehicles meet and exceed industry standards before they enter our showroom. We also have a leading team of experts on staff at our Oakville dealership ready to evaluate each vehicle and ensure that it exceeds our dealership standards. It is our promise to you that you will drive away in a vehicle that will provide you with comfort and longevity. 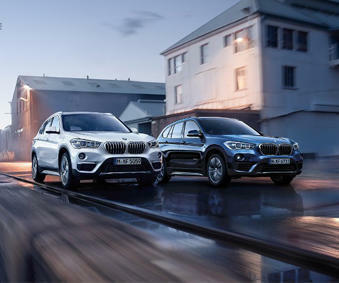 If it is in your budget to purchase and customize a brand-new BMW SUV, you will find on our website a wide range of upgrades that you can make to your vehicle to suit your individual needs. Whether you need a top-quality entertainment system in your vehicle to keep your little ones quiet on long journeys, or you prefer to have a personal concierge to assist you with finding restaurants for business meetings with clients, we are certain that we can customize your vehicle to suit your lifestyle perfectly. Our top SUV ratings in Oakville are proof that we place high value on providing quality vehicles and excellent customer service. Another reason why we have top SUV ratings in Oakville at Budds’ BMW Oakville is because we stay connected with our clients long after they have driven their dream vehicle off of our lot. We make it a top priority to maintain relationships with our clientele to ensure that they get the most out of their experience with Budds’ BMW Oakville. We understand the importance of having a reliable and comfortable vehicle that will last for years to come, so at Budds’ BMW Oakville we promise you quality, reliability, and connectivity. Should you have any enquiries about our top-quality SUVs, call us today or visit our website to book a test drive appointment.